Here's a fantastic welcome gift for the new little champ or a terrific first birthday present for a child beginning to step up in the world! This dual purpose Sit-Down-Step Up Flip Stool conveniently converts from a chair with a seat back to a step stool. • The dual purpose step stool is made of wood, finished in white and decorated with a winning sports motif. A practical and beautiful gift all-in-one! • No assembly is required! 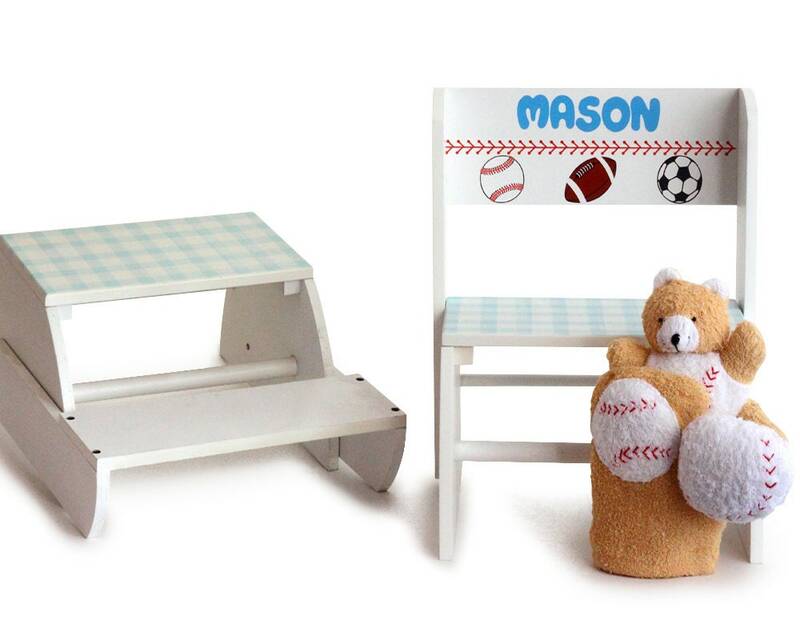 • The dual purpose flip-stool comes personalized with the child's name on the seat back. • The following bath items are also included for the little slugger: terry baseball bear toy, baseball shaped sponge, and a bath mitt with baseball embroidery. • Ships wrapped in clear cello with ribbon, bow & gift message attached (not shown).